Pours a rich, reddish brown with a tall tan head that doesn’t linger. A quick blast of alcohol tickles the nose, opening it for aromas of caramelly dark bread. Slightly boozy dark fruits – plums and raisins – dominate on the palate. Contemplative, pairing with a Monk’s music. The other night, we came over to Hearthstone Coffee House & Pub for a drink. We brought the list, as we wanted to see if they had any beers that were a part of 1001 Bottles. They did. One. We ended up drinking a Fat Tire. Boring, I know, but it is still on the list and I treated it like every other beer. Well, we liked drinking/writing here so much we came back when they got Brother Thelonious in. They have it on tap, but also landed a few bottles. We got to talking, and before we left, Hearthstone became the second official sponsor of 1001 Bottles! We are excited to have them on board. They are RIGHT across the street from where we live, so it’s an easy place to get to. So if you live on the north side of Indianapolis, let us know… we will invite you the next time we drink at Hearthstone. In the Glass: The beer is a dark brown, almost red. It’s also quite cloudy and has a certain thickness to it. When I swirl it around in my glass, I hope for a thick lace. Wrong. The lace is pretty much nonexistent. But that is what you tend to get in a good barleywine. We all know my recent obsession with barleywine. Nose: It smells sweet, dark, and has a certain boozy smell to it. The beer is 9.3% ABV, so I guess I can expect that. But I keep comparing this to a barleywine. I hope it lives up to the hype! Mouthfeel: This beer starts and finishes oh so smooth. There is a lot of booze on the middle of the tongue, but I accept it with this big of an ABV. The beer definitely tastes better than it smells. That’s for sure. Let’s dig a little deeper into the aftertaste. Aftertaste: The aftertaste sits in quick. There is a hint of sweet at first, then it quickly turns into a warm dryness that is sort of unexpected. As it sits there on the tongue, it doesn’t really dwindle. The boozy notes stick around, and the burp brings back the sweet/bitter flavors that the tongue loves as you drink. This is a great beer that has a really cool history. A percentage of their profits apparently go to support jazz music. I mean, on the bottle it says they support jazz education. I like the logo too. The monk just looks so cool, calm, and collected. Oh, and the skull. Love the skull. This is a great beer. Bottoms up people! Tonight we have a new venue for 1001 Bottles – Hearthstone Coffeehouse & Pub! This place is great, and it’s right across the street from our apartment (aka stumbling distance). They are a new sponsor of 1001 Bottles, and we will be doing more beers from here soon, so please come join us! 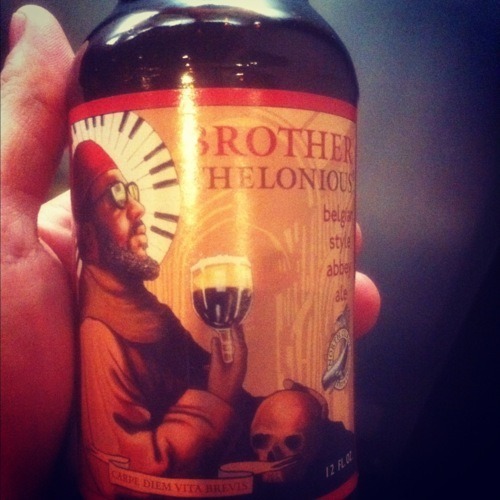 We are trying Brother Thelonious tonight. I know I have had this beer before, but once again, I can’t remember where or why or how it tasted. I’m pretty sure it was good, though. It pours out a dark reddish-brown color in the glass, not too thick and not too thin. The nose, to me, smells nutty at first. That’s the strongest scent I am hit with. Maybe a little spice in there too. There’s not much head, but that could be just because I know how to pour a beer. I have a feeling this beer could have a lot of head if poured differently. First drink… Yum. This beer is good. I knew I liked it. It’s got lots of spice and a very rich flavor. It also leaves a solid aftertaste. Here’s what I taste in it: the nuts mentioned before as in the nose, cinnamon, spices, and a bit of carbonation. It all amounts to a very rich flavor that just tastes good and goes down smooth. It leaves you wanting more. I like it and am definitely a fan. One I’ll probably buy again and again!